I frequently receive emails asking why two-tone Constellations are described as 'Gold Capped'. Others query the differences between gold cap and the various methods of plating a base metal watch case with gold. I've put together an article on the most common plating methods and offered an explanation of why Gold Cap is so 'special'. My thanks to Evan Morgan and Damien Debin for their assistance. I'm on thinking of buying my first and probably last Connie. As I am not rich, this will probably blow my entire Connie budget for a lifetime. It's as far as I can tell a mid/late 50's gold capped pie pan with arrowhead markers. My question to you is, are all the gold capped models equipped with a gold coloured crown? I haven't yet had this watch in my hands, but the (bad and distant) photo appears to have a stainless crown. Is this something I should be cautious about? I'm not buying online, but rather locally, so I can have the watch in my hands and make a somewhat informed decision without risking anything (I at least know enough to spot a bad redial a mile away). If it's indeed a replacement steel crown, that would not really bother me. Should it? It appears to be correct as it is ten sided. The seller is a guy who is cleaning out his junk drawer and knows nothing about Omegas, other than a quick google on valuations. He insists it has been untouched for decades and is literally grandpa's watch. I believe him. I of course asked about originality and what's under the hood and he said it's never been opened as long as he's known about it. Closet treasure or el-crappo E-bay remorse quick sell? Hmm, I would want to look under the bonnet myself to see which movement powers the model. That will enable you to ascertain which crown may be needed as earlier movements had a different crown stem size that say the cal 551/561 models. To answer your question, yes gold capped models always had the gold crown. A steel crown would in my opinion look quite out of place. Strangely crowns for earlier 354 and 501/05 models are still available but the ten-siders for cal 551'561 model arent. Given your comments about your budget for a vintage, I would suspect that you really need to be judicious in your purchase. Also factor in the fact that you'll need to spend a couple of hundred probably to have the watch di-assembled cleaned and oiled. as running it dry would kill it eventually. If you can get some good pics, email me (click on about me and click on the email button)and I can have a look at the piece for you. While the clear crystal is the most numerous, I'm sure some Constellations were sold with cyclops date windows. Most of the models with cyclops were around and after the model 168.025. The other thought is that at some stage the crystal could have been swapped. I share your passion for Omega Constellations from the 60's. I have a Gold Capped Constellation with a 564 on a serial number of 24,764,353. I am having trouble dating this watch accurately and I do not wish to pay CHF120 for an "Extract of the Archives". The caseback is marked 168.005 and I have CD 168.005 on my records. I have the original receipt from 1971 from a local jewellers who is still trading in Exeter (Brufords). 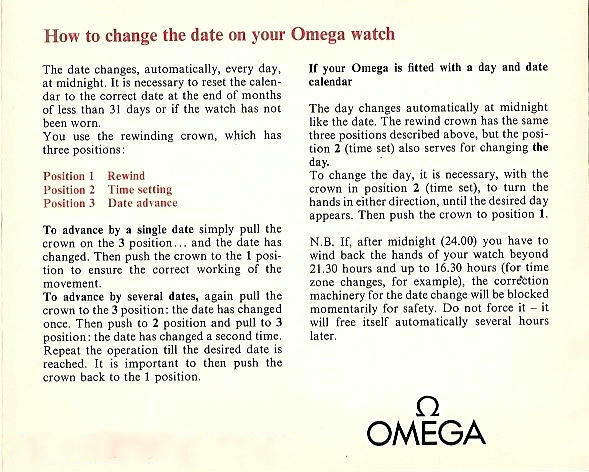 The watch is presently not working correctly and I am considering sending it back to Omega in Bienne fro a service, but my previous experience with a Constellation returned with a Seamaster dial on it is proving a stumbling block at the moment. I have never worn that watch since as it was returned with a copper coloured Constellation dial on it which is so rare that I have never seen another. Production of your watch would have been late 1966/early 1967. Quite normal for a watch to be in inventory for some time, however four years is regarded as long. These were expensive watches at the time and that explains why it stayed around quite a while at the retail end. Under no circumstances would I personally consider sending a Constellation to Omega in Bienne. 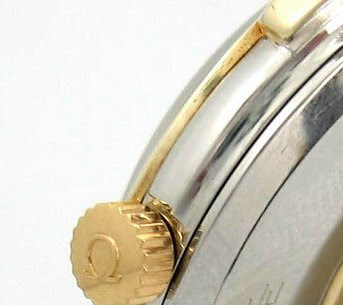 The service 'regime' is that of turning an old watch into new looking, and this what your will get back is an expensive and not necessarily sympathetic restoration. Bienne is good for vintage watches where original parts are in stock, such as some tool watches of the Seventies, so I would source a good local and independent watchmaker and simply have the watch dis-assembled, cleaned and oiled. Possibly a case back gasket should be replaced and of course the crowns are no longer available. Ryte Time in Leicester has a good reputation. Hi. I dont know if this blog is still maintained. If it is. Could you post a new link for the pdf - the one in the post, does not work anymore.